Bianca Mori: Takedown Trilogy: Blog Tour and raffle WINNERS! Takedown Trilogy: Blog Tour and raffle WINNERS! 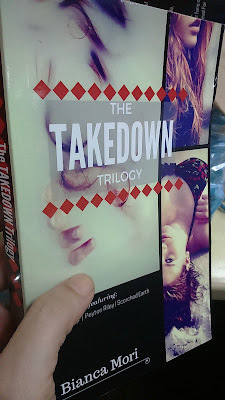 The Takedown Trilogy blog tour ran from August 15 to 21 to spread the word about its independent paperback super edition and wide release in other ebook platforms. What is the best part of being a romance author? It’s a powerful thing, being able to evoke powerful feelings in people. I guess it’s easier to scare or disgust a person than to make them relive their happiest memories of love — or desire or attraction. Being able to do that, in however small way, is awesome. How do you plan out the fight/action scenes in your books? On that note, how about the steamy scenes? I already know what they’re going to do, in my head, because I see it like I see a movie. But getting it from my head, from a visual place, to paper, is difficult. For me, fighting and, er, f***ing scenes are both action scenes, and the process of writing them is similar. They are both tricky in the sense that they’re both what I like to call ‘verb’ pieces. It’s very easy to fall into a trap with verb pieces to become choppy, like ‘He did this. Then she did this. And then he did this back.’ And that’s a pain to read. The challenge for me is to accurately describe what’s going on, but mimic the tempo and flow of what’s happening with the writing style. So with a fight scene, I could do like a staccato rhythm and try to write around some actions to get that sense of dread and adrenaline going on. Alice Kamatis wrote a two-part review of the series! While reading the second book, I stumbled upon a quote in social media that books talk to you and this one does. I wanted to tell Peyton to swallow your damn pride woman, there's a perfectly good catch you have there and he's in love with you, but of course I couldn't blame Peyton. The blog tour also included stops at Carmel & Kyla's blog, Writing & Lovin' It and Beth G's Stories. 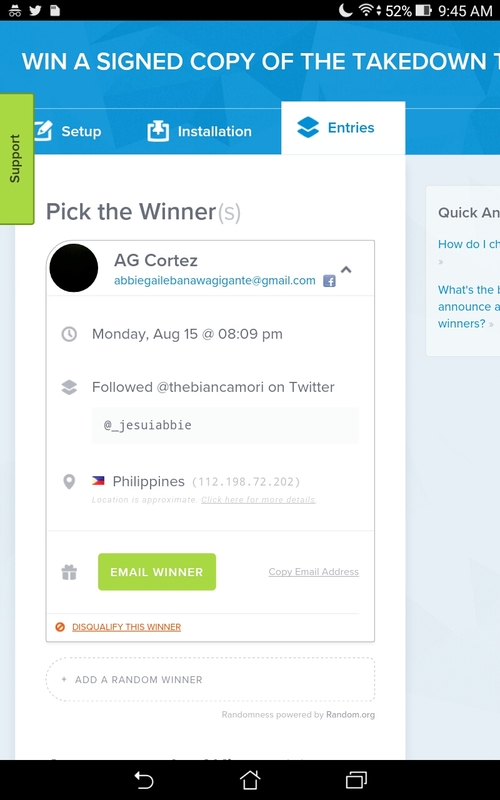 And now for the winners!!! One blogger and one reader will each win a signed copy of the Takedown Trilogy paperback. You can also order the paperback (Php350+shipping) by emailing thebiancamori@gmail.com. Share book reviews and ratings with Bianca, and even join a book club on Goodreads.